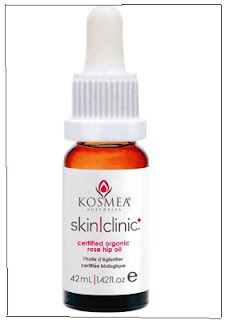 About a month ago, I wrote about Kosmea's Rosehip Oil, and how so many people have been raving about it. I also mentioned that I got myself a bottle, and would post a review later on. I've been using the oil for just about a month now, and I thought I'd post my review. The oil itself is not too heavy, and absorbs just right if you apply it on damp skin. A lot of people have commented on its strong smell, but it doesn't really bother me. Not at all, in fact. It just smells like dried roses, or rose tea. It's quite pleasant, actually. As far as scar removal goes, it hasn't been doing much for me. I got scratched twice on my hands just as I started using the oil, so I applied it to my scars to see if they would fade any quicker than they usually do. So far, the scars haven't faded, nor do they look any lighter than scars usually do. One good thing I have to say about this oil is its amazing effects on my skin's oiliness. I have really dry skin, and everytime I go out, my nose gets terribly oily by midday. The rest of my T-zone gets oily and gross, too. Since I started using the Kosmea oil, I am very happy to report that my nose no longer gets oily, and my skin is nice and balanced! I don't know what to say about 'radiance', but I can report that my makeup looks a lot better since I started using this oil! It stays on for longer, and looks nice and dewy, even at the end of the day. I would definitely get this oil again. Even if it doesn't remove scars, it does wonders when it comes to reducing my skin's oiliness, something that I haven't yet found in another skin product.